Elastic Industrial Back Support Belt - Suspenders, helps stabilize the spine by creating intra-abdominal pressure, ideal for lifting and industrial activities. 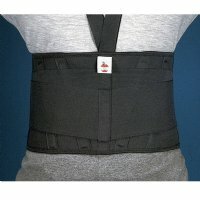 The Elastic Industrial Back Support Belt also helps improve posture and serves as a reminder to use proper lifting techniques by limiting the motion of muscles and ligaments. Easy closure assists provide additional leverage with minimal effort for extra compression and a secure fit; ideal for user with arthritis or weakened muscles. Flexible internal stays provide support and stability as well as help prevent the sides from rolling. Dual elastic side pulls provide firm compression. The anatomical form contours to the natural curves of the waist and hips for comfort. The soft elastic CorEdge finish on top and bottom edges offers added comfort and flexibility.